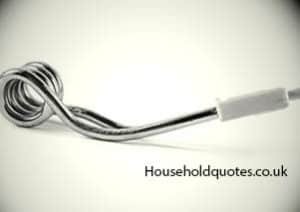 Some homes in the UK have an immersion heater as a backup source of hot water for the central heating system. An electric immersion heater heats the water in the storage cylinder and provides hot water when the central heating is switched off. Immersion heaters often come on during the off-peak hours to take advantage of lower electricity tariffs. Depending on the size of the hot water cylinder you may have one, two or even three heating elements. Heating elements will last a very long time depending on use, but eventually, you may need a replacement. This article will guide you through the world of immersion heaters, what to do when one packs in and whether you should do this type of job yourself. First, check and confirm the source of the problem is not in the fuse board. If the MCBs check out go ahead and isolate the circuit in the consumer unit and turn the switch off next to the cylinder. It is vital to make sure the immersion heater is electrically safe before proceeding. The next step is to test the heating element and to test there is no power. You will need an electrical test meter for this. Disconnect the electrical wiring and check the thermostat first by setting to its maximum temperature and measuring across the terminals on the resistance setting. If there is continuity the thermostat is ok, if not, you need a new thermostat. If the thermostat is ok, you will now need to test the element for continuity to confirm it is faulty. If the meter shows a very high resistance reading, then the heater is broken, and you will need a replacement. Purchase the correct replacement part and use a box spanner to loosen the immersion heater element. Always remember to drain the tank before removing the broken to avoid a manmade flood in your home. Wire in the new immersion heater and ensure all electrical connections are tight before restoring power. Refill the storage tank with water and you will be able to tell within a short time whether the heating element is now functioning correctly or not. How much does it cost to replace an immersion heating element? If you do not have the time, skill or desire to carry out this job yourself, you can always call in an electrically qualified plumber. Changing an immersion heater is one of the few jobs where you may need both an electrician and a plumber, but that’s in very rare cases. For most plumbers this is a task they can do with no problems. Replacing two or three elements at the same time for two or three element cylinders. The chances are if one has failed then the others will soon fail, assuming they were all installed at the same time. You can save yourself labour costs and inconvenience by having all elements replaced. Call-out or planned job – you may find you will pay a premium price for an emergency callout. The type and size of immersion heater (copper being the cheapest and does the job just as well). Where you live in the UK has an impact on pricing as the London factor is always taken into account when pricing trade jobs. How long will it take to replace an immersion? Most plumbers will charge half a day for the pleasure of replacing your immersion heater for you. How long the job will take from start to finish will depend on the accessibility of the hot water tank and the immersion heater. Also, the tank has to be drained so depending on the size of your tank you have to take the time it takes to drain it down into account. If it’s a three element tank and the bottom one needs replacing, you will have to empty the tank. However, if it is just the top element, the plumber may get away to emptying the tank to below the immersion heater level. Whatever the situation, you are looking at a couple of hours before the old comes out and the new goes in. Your skill level and confidence to do the job. Having the correct tools for the job (you need a special immersion heater spanner). Having the right replacement immersion heater to hand. A proven track record for performing similar jobs. Be registered with a trade body and be professional. Have a checkable work history with reviews from past customers. Must be insured and offer a guarantee for their work. Instead of searching for the different plumbers working in your location, why not just fill in the quote form and be put in touch with professionals in your area. Get Your FREE Plumbing Quotes NOW!